Night Time Diesel Fuel Delivery Service in Connecticut by City Oil Inc. - City Oil Co. Inc. If you are tired of sub-par service from other diesel fuel delivery companies look no further than City Oil Inc. We know that it can be frustrating having delays and overpriced fuel that you need to do your job. City Oil admires hardworking people and treat them and their equipment with the courtesy and respect they deserve. At City Oil Inc., we offer 24/7 delivery options to companies in the Connecticut area and have been doing so for over 25 years. With this hard-won experience, we know what it takes to get the fuel to our clients on time, every time. We have 18 trucks that serve hundreds of clients daily, each one is a happy customer. One of the things that makes our company unique is our 24 hour a day, 7 days a week delivery options we deliver diesel fuel overnight. It is very convenient for companies to use our diesel fuel delivery service at night. Every morning you can come to work and all your equipment and trucks are full and ready to go. We have one distinct goal with each and every company we deal with. To provide quality services to both residential and commercial customers. Nothing is more important to us than making sure that your fuel is delivered to you on your schedule, so that everything runs smoothly for you, without any headaches or delays. Perhaps you are beginning to see the benefit of having night time diesel fuel deliveries, but you are having trouble finding a company that delivers fuel at all hours of the day and night. This is a requirement if you want to make sure that you can start the day with a full tank in each vehicle and piece of equipment at your site. That’s why we specialize in night time diesel fuel delivery. This one service separates us from all of our competition and puts you in the driver’s seat allowing you to start the day’s (or night’s) work whenever you wish. City Oil Co. Inc. only sells Ultra Low Sulfur Diesel (ULSD), which is the industry standard for diesel-powered vehicles and equipment. We use Clear/On-Road ULSD for all over-the-road deliveries, and Red Dyed/Off-Road ULSD is typically used for construction equipment and generators and is sold without the additional fee of federal road taxes. Our Premium Diesel fuel products are mixed with a special blend of additives which helps protect the fuel on cold nights during the winter months. This ensures that you will receive quality fuel for peak conditions. City Oil Co. Inc. also provides On-Site Diesel Fuel Services. This means that we can pull our diesel tankers right up to your construction yard or job site, making it very convenient to fuel your vehicles and equipment with no down time. Offering multiple fuel supply solutions, such as short and bulk load deliveries, and automatic schedules, City Oils fuel delivery service is the most dependable in the industry. 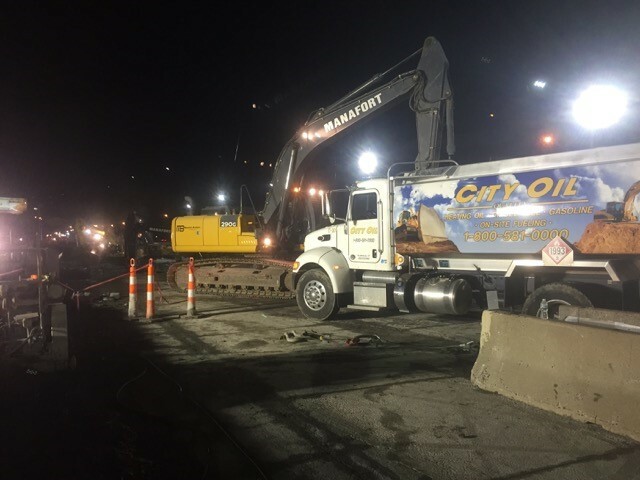 City Oil Co. Inc. provides portable fuel tanks and pumping equipment, making it easy and efficient for our customers’ working days or nights, in any situation. This ensures that you will never run out of fuel again. Running out of fuel means lost time and therefore lost money. Since your success is our success, we will never allow that to happen. Our tanks range from 275 to 3000 gallons. We use Standard 110 Volt, or 12 Volt Pumps. Our tanks are top of the line and meet UL Fire Codes, Osha, NFPA, and NFPA30 requirements, so you can rest assured that you will meet all codes with flying colors when inspection time rolls around. City Oil Co. Inc. is the clear choice for all of your fueling needs in the Connecticut area. With our quarter century of experience dealing with every need a client could have in this industry, we know how to perform under pressure to get you your fuel on schedule every time. We are the industry leader in Connecticut for a reason, and that reason is customer service. Call today to place your order with us and know that you are getting the very best in the industry to service all of your diesel fuel needs.